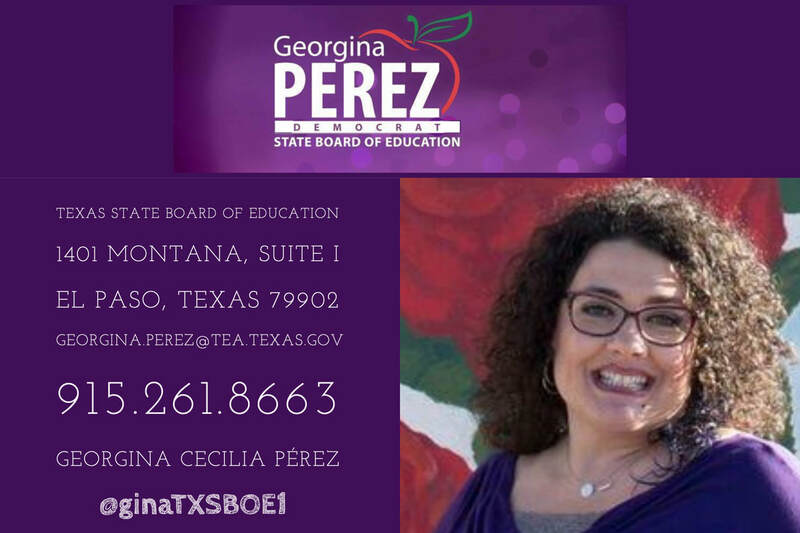 ​The Texas State Board of Education does not provide a stipend, or funding for an office or staff. While TEA continues to defend their STAAR exams, several members of the TXSBOE requested a more recent validity evaluation to be performed by a third party. Until there is public trust, this continues to be an expensive failure funded by taxpayers. One of my concerns regarding TEKS is that our documents are both teaching and testing tools, meaning that the objectives are the minimal requirements of what teachers must teach and (via STAAR) what TEA must test via STAAR. This legislative requirement minimizes what we send to teachers in order to reduce the number of questions on STAAR. The second of my concerns is TEA providing limited professional development on the TEKS to our ISD's. The Reading Academies are offered to only K-5. This results in random organizations delivering a variety of interpretations of the TEKS which often vary from the intent of the TXSBOE and the assessment division of TEA. The lack of consistency from TXSBOE to TEA to Professional Development results in our students suffer and teachers being held responsible. In June of 2019, the Texas State Board of Education will review high school graduation requirements to address the issues with International Baccalaureate programs and Endorsements. 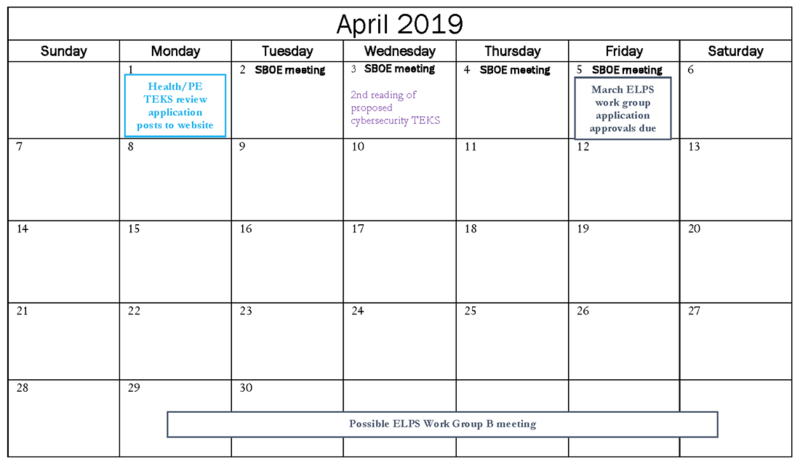 The expectation is that these issues are resolved and implemented in the 2019-20 school year. TEA's Instructional Materials Quality Evaluation (IMQE) - established in 2017; a $10M project of which only 30 of 1,023 ISD's are participating, and only 7 publishers submitted materials of which only 1 was state adopted. 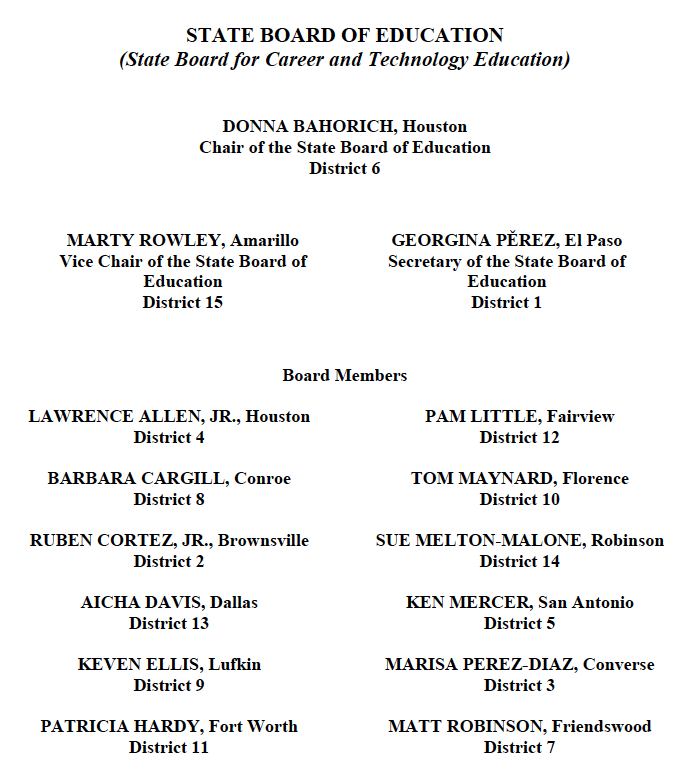 TXSBOE members have expressed great concern with the Texas Education Agency's IMQE process: 1) There is little to no public input and no oversight; 2) TEA contracted to a Common Core entity which has never worked in Texas or on Texas materials; 3) The process aims to remove the TXSBOE process which is the means to public input and transparency. Leaving many of us questioning why taxpayers are paying twice for the same work. These concerns resulted in the creation of an Ad Hoc Committee which will be kept informed as to the progress of this project. Texas Lesson Study - established in 2016; an $8M project of which only 80 ISD's are participating. Several members expressed concern as to the pedagogy applied as well as the expense in terms of taxpayer dollars at the state level and local campus level - in addition to the time and effort on the part of teachers. Ultimately, this is education which should be taught in the colleges of education rather than the result of underperforming teacher certification programs and TEA's allowance of non-certified and non-credentialed teachers in our classrooms. Courses of Innovation - after reviewing the latest applications for approval and renewal, I have requested the following additions to applications: 1) location where the course is planned to be offered and the realistic potential and impact across the state; 2) cost to districts / subscription requirements; 3) Texas-based data as to success rates / improved student outcomes *applicable to renewals. Sen. Larry Taylor, chair of the Senate Education Committee, today administered the oath of office to seven State Board of Education members who are beginning four-year terms of office. Returning members, who were re-elected in November, are Brownsville businessman Ruben Cortez, Jr.; San Antonio education administrator Marisa Perez-Diaz; Houston educator Lawrence Allen, Jr.; and retired Fort Worth educator Pat Hardy. Members joining the board for the first time are Friendswood urologist Matt Robinson; Fairview businesswoman Pam Little; and Dallas educator Aicha Davis. The petition to allow Debate to satisfy a Fine Art credit failed. Debate remains categorized as an elective or an acceptable English IV course. The cybersecurity course passed the preliminary vote at First Reading and Filing Authorization, public comment period coming soon. Click here for details. 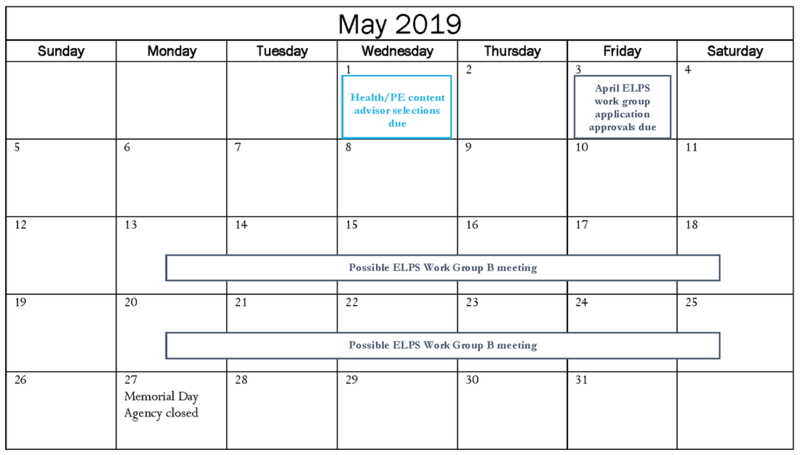 There are currently three approved contractors providing high school equivalency exams, whose contracts expire in August 2019. One of the three will not seek business with the state of Texas beyond Aug 2019. The other two requested an increase in fees approval from the TXSBOE. Both contractors requests were approved 13-1. I voted against the fee increase as I do not support a $25 increase (from $0) to register to take an exam and an additional increase in fees to take the exam. 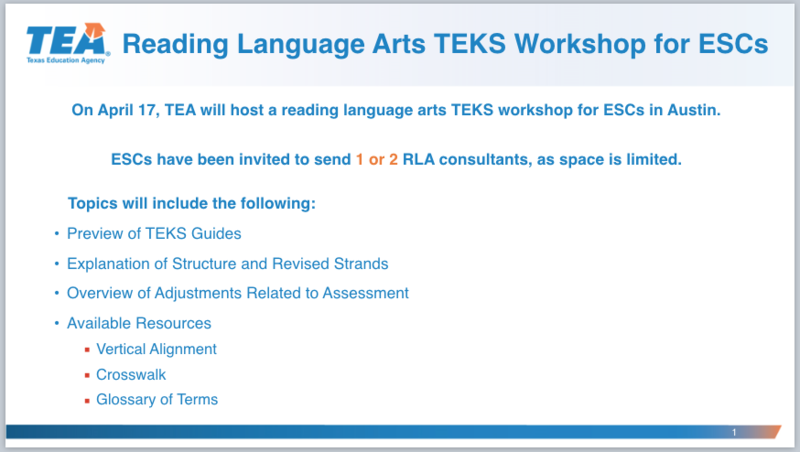 1) Additional training (and information) for the Review Workgroups, detailing/explaining how the TEKS documents are both teaching AND testing tools. ​TEKS documents provide the minimum information that teachers are required to teach AND what the state must test. 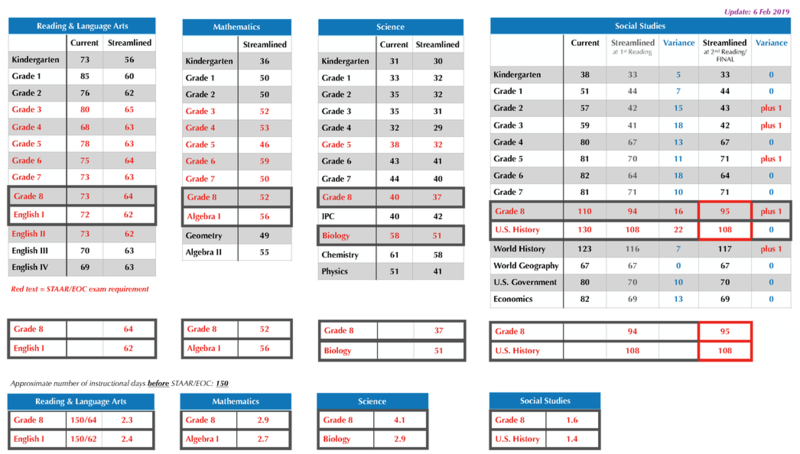 Example: The reason that Social Studies Streamlining was a topic of discussion during two legislative sessions is because of the ridiculous amount of standards injected into the 2010 TEKS, resulting in not only the teaching of double/triple the number of standards (as compared to other content tested courses) in Social Studies classrooms. The 2017, 11th-grade U.S. History test (a graduation requirement) was 82 questions long. *Additionally, an added value to the training will be definitions of verbs and how these are assessed. Example: How is "evaluate" taught in the classroom and how will it be assessed on STAAR/EOC exams. 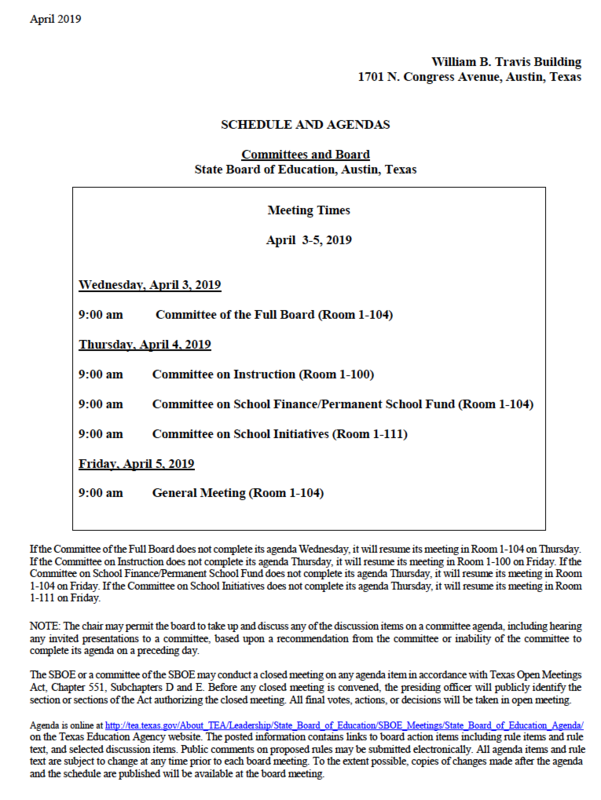 2) Extending the TXSBOE meetings (by 1 additional day) when discussing TEKS review, revision, amendments, etc. 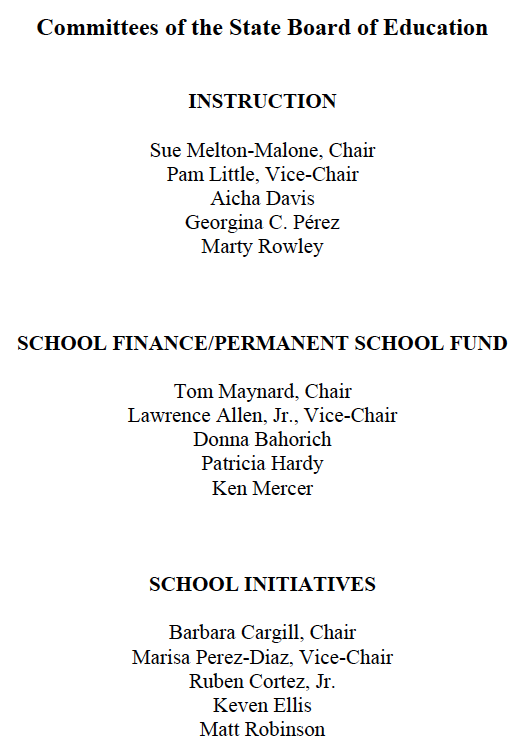 ​TXSBOE Member, Keven Ellis, was appointed to the Commission on Public School Finance. This presentation is the summary of the full report. ​Micheal Morath, Commissioner of Education, delivers updates from the Texas Education Agency each TXSBOE Session. ​Nominations needed for reviewers of English Language Arts and Reading and English as a Second Language (ESL) instructional materials to determine the extent to which the materials address the Texas Essential Knowledge and Skills (TEKS) and English Language Proficiency Standards. 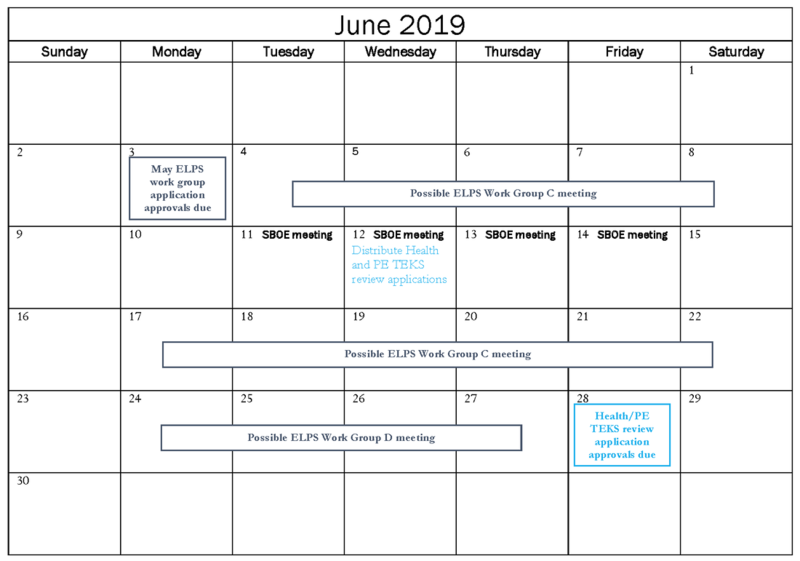 In April, the State Board of Education called for instructional materials aligned to the new high school TEKS and to the TEKS for two middle school ESL courses. The materials will be reviewed during the summer of 2019 and available for use in the classrooms in the 2020–21 school year. Please consider joining us—or nominating someone else to join us—for this important work. Teachers, administers, parents, business community members, and others with appropriate content knowledge are all welcome. Candidates must be available during the weeks of July 22 and 29, 2019, be proficient in Microsoft Excel, and be able to read on a computer screen for an extended period. Click here to nominate yourself and/or a colleague - select Instructional Materials TEKS Review Panel. The Texas Education Agency (TEA) requests preliminary public comment on a draft list of industry-based certifications to be used for public school accountability. The new list of industry-based certifications is scheduled to go into effect for the 2019-2020 school-year and will apply to school accountability ratings in August 2021. The public comment period is now open and will close on February 4, 2019. Click here for more details.